Mark McCarthy breaks away with Angel Sanquintin in pursuit. 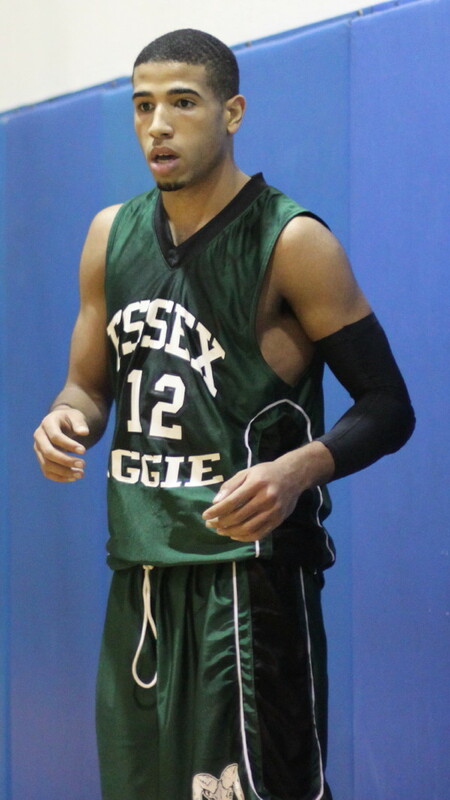 (Georgetown) All kinds of offense on display as Georgetown defeated North Shore Tech (Essex Aggie), 72-60, in nonleague action on Thursday night at GHS. The final margin is very misleading because with 2 ½ minutes left this was a 3-point game (58-55) with no certainty of the outcome. 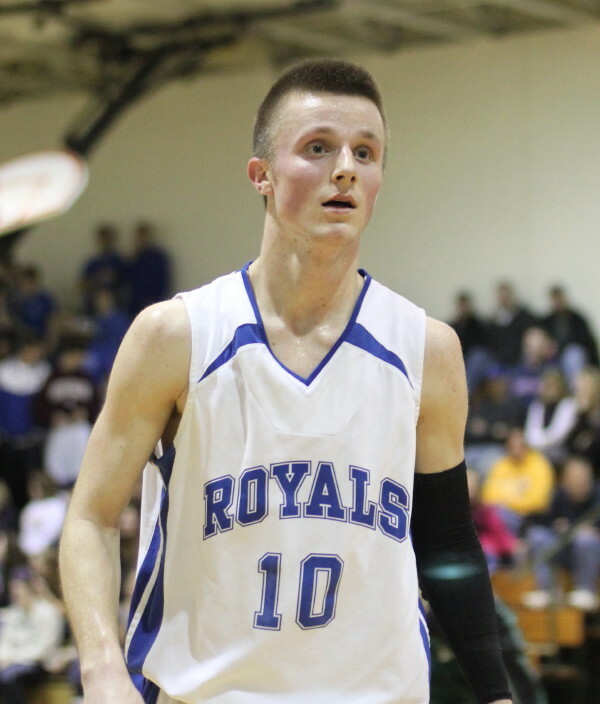 The undersized Bulldogs (2-4) from Middleton hung around thanks to nine 3’s. 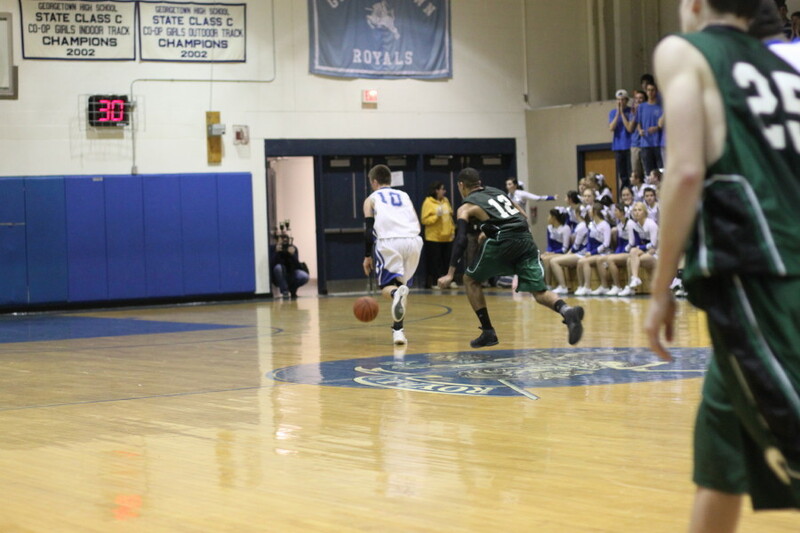 Tyler Wade (27 points) is the one they were talking about afterwards and rightly so. 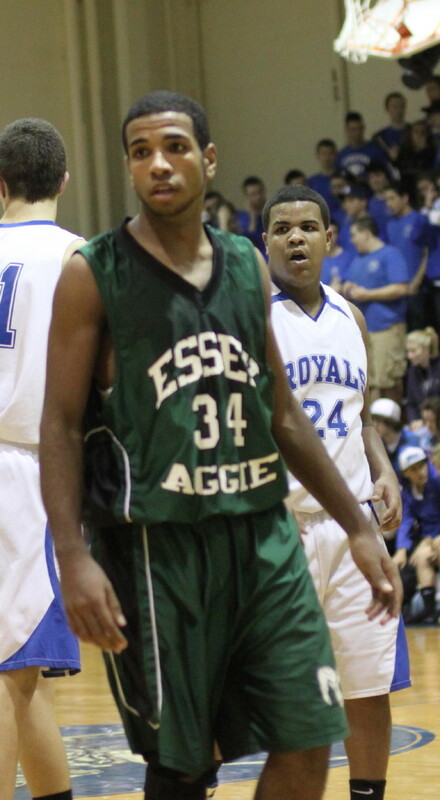 He dazzled in the second half collecting twenty-one of those points. 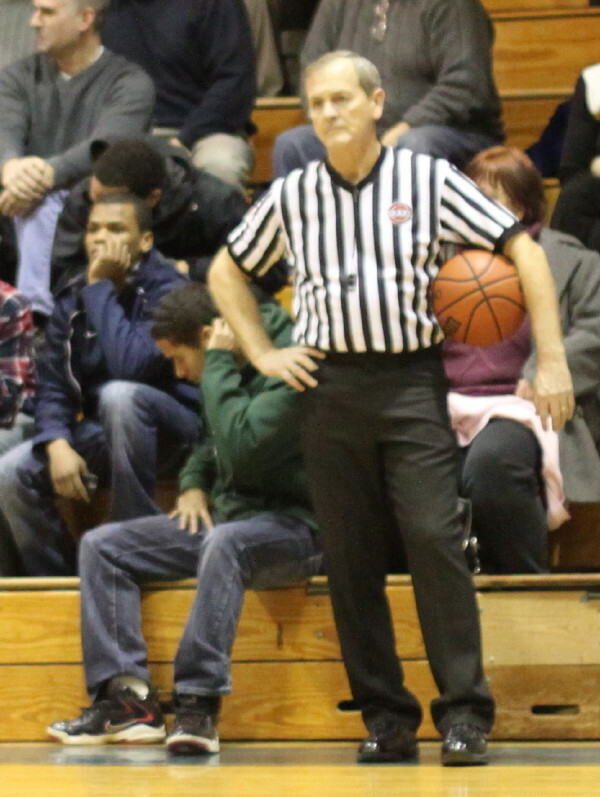 He stole off the Bulldog backcourt several times and was off for layups. My stats found a second hero for the victorious Royals – Angel Sanquintin. 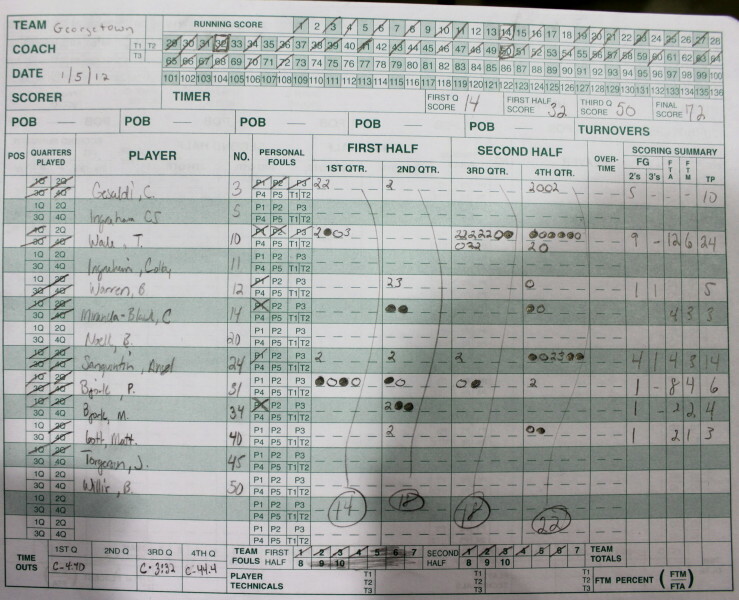 The box score only has the junior for fourteen points but eight of them came in the final quarter. With the Bulldogs well within range of victory (58-55) with 2 ½ minutes left, Angel put on an unanswered show from all the scoring stations over the next minute to seal this one for the home team. He started with a layup and quickly followed it with a three on a pass from T-Wade and then made two free throws. The result of Angel’s scoring was that with 1 ½ minutes left the Bulldogs were down ten (65-55) and they weren’t coming back. 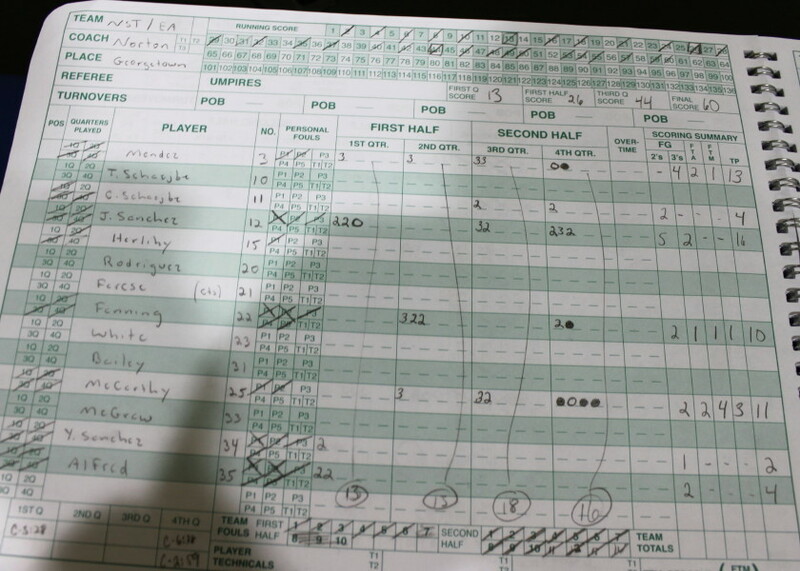 Jazz Sanchez had sixteen to lead North Shore Tech, including four 3’s. 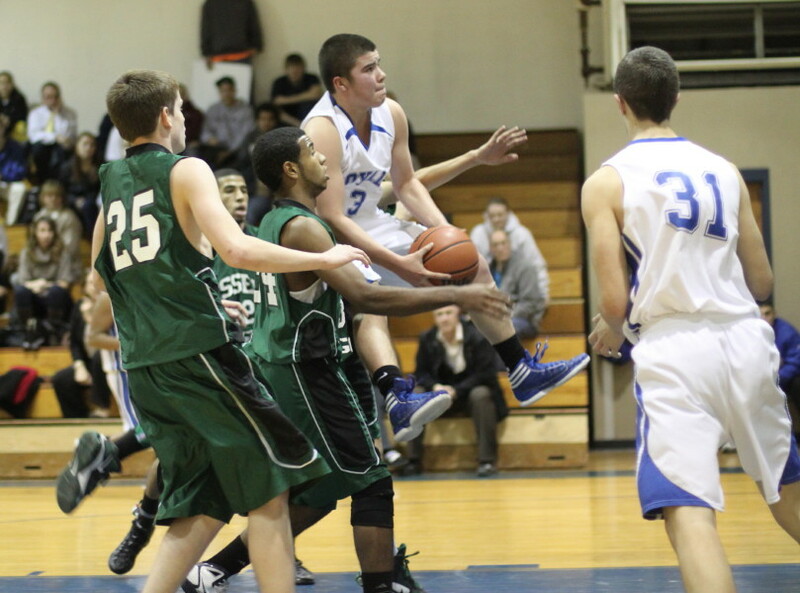 Jordan Mendez (13), Mark McCarthy (11) and Ryan Fanning (10) were also in double figures for the Bulldogs. If the strategy of North Shore Tech was to score from long range, the strategy of Georgetown was to take the ball to the basket. 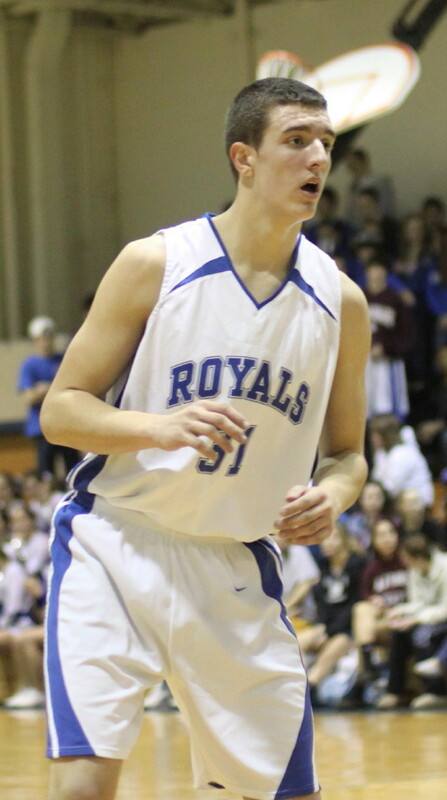 The disparity, as a result, in free throws was 35 for the Royals and 8 for the Bulldogs. It certainly helped keep NST around in the game that the Royals missed SIXTEEN of those free throws including a number of one-and-one’s. I don’t recall that T-Wade played at all in the second quarter. I thought at the time that perhaps he was sick or injured. What he was, as it turned out in the second half, was rested. The Georgetown student section was well organized and entertaining. They can be counted on to show little mercy to opposing teams and players. They were clever enough in this one to have the Bulldog coaches and players smiling. The chant of “Groom your horses,” caught my ear. There was a reference to “fertilizer” in the first half that might have topped that one. Johnny Spears (now of Pingree) was in the crowd. 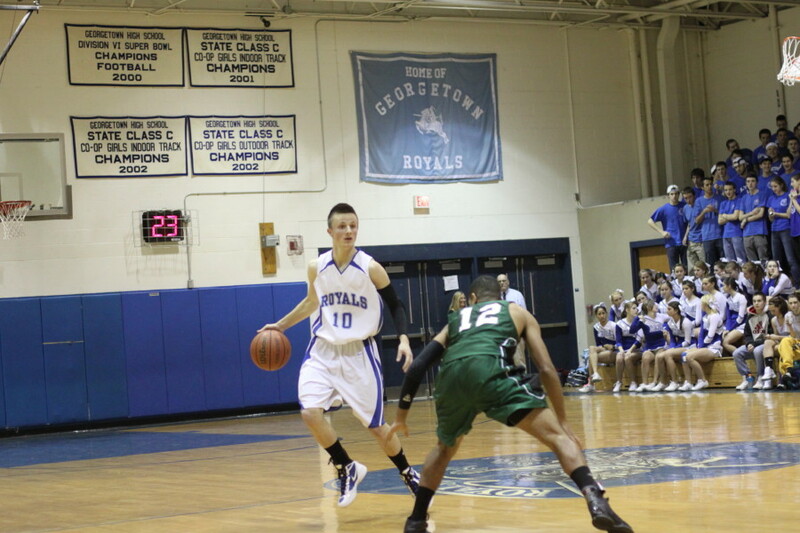 There will probably be games ahead when GHS coach Mike Rowinski will wish that Johnny was still wearing the Royal blue. Tyler Wade breaks loose after steal. North Reading presses for tying goal late in the third period. 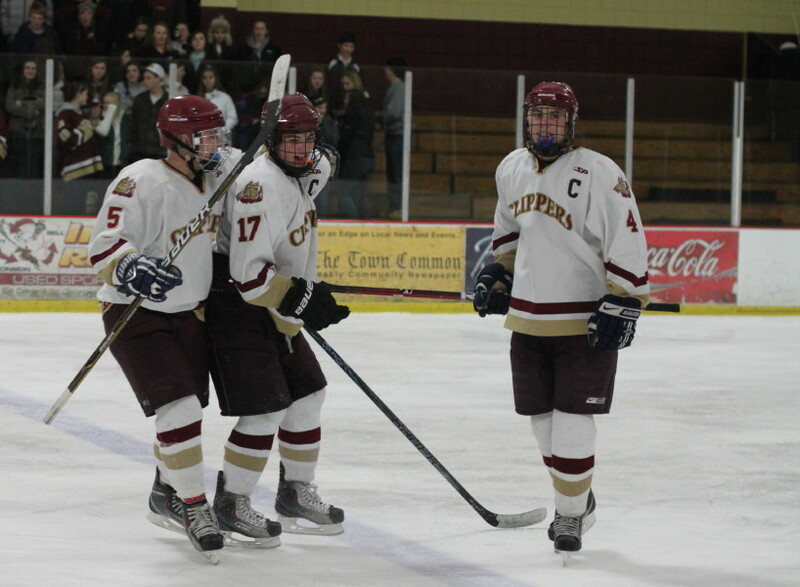 Cooper Hines (17) congratulated by Travis Wile (5) and Cam Roy (4) after scoring 4th Clipper goal. 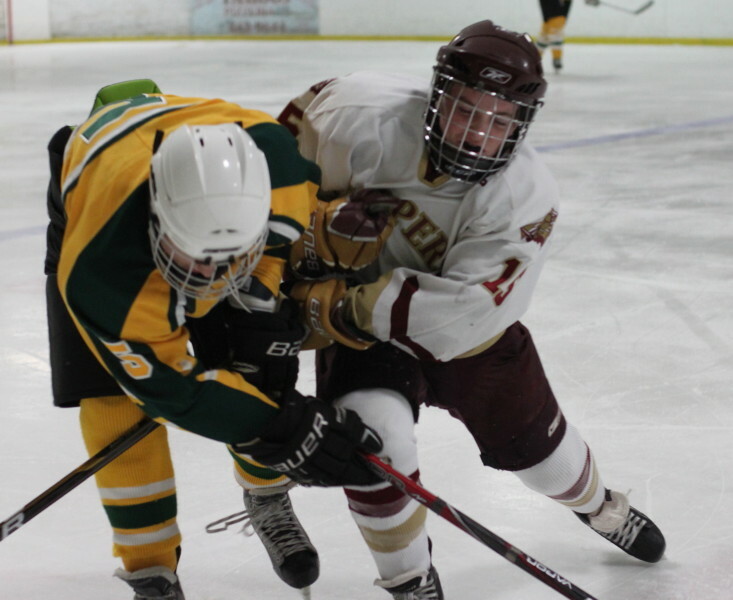 (Newburyport) Newburyport (2-3-1) scored a couple of goals early in the third period (Cooper Hines & Matt Kelleher) and then hung on for dear life before defeating North Reading, 5-4, at Graf Rink on Wednesday night. 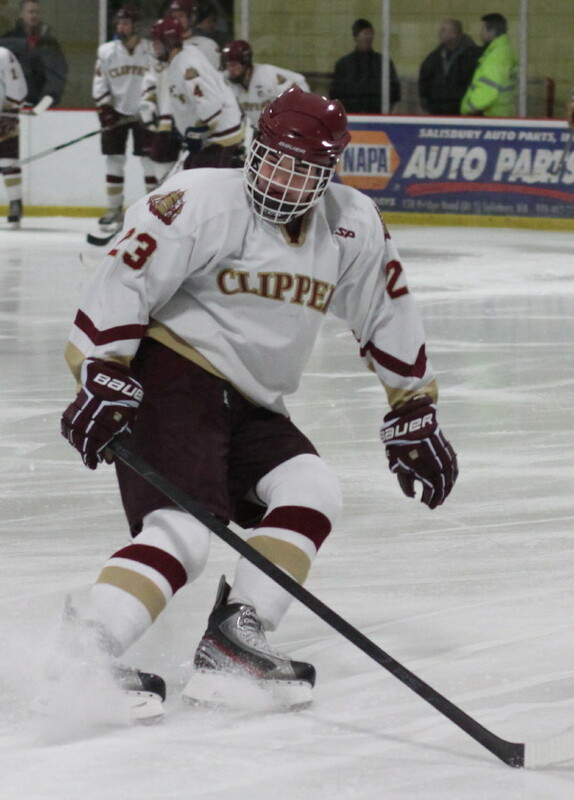 The Clippers, 2-2 in Cape Ann League games, had plenty of shots (38) but they neutralized that advantage by surrendering power play goals to the Hornets. One of the more remarkable things I’ve ever seen at a sporting event happened even before this game started. 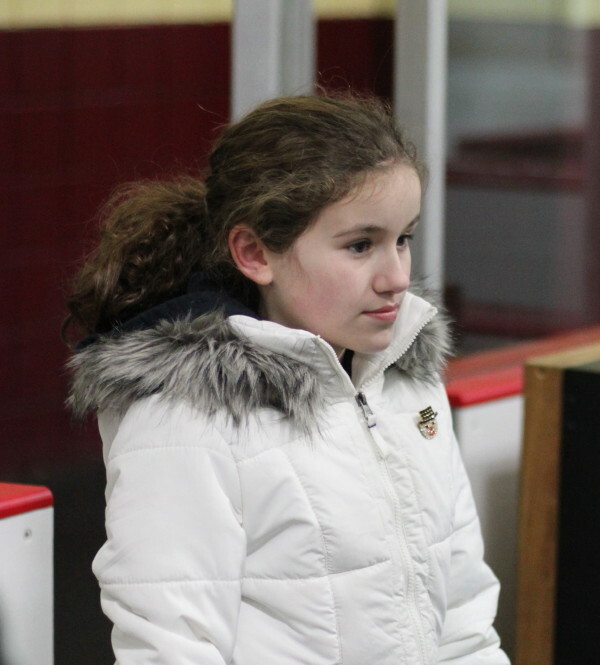 NHS coach Paul Yameen’s young daughter was delivering a wonderful rendition of the National Anthem when the Graf Rink microphone kicked off. What next? The crowd picked up right where she left off and delivered a rousing conclusion to the song. Spontaneity at it’s best! 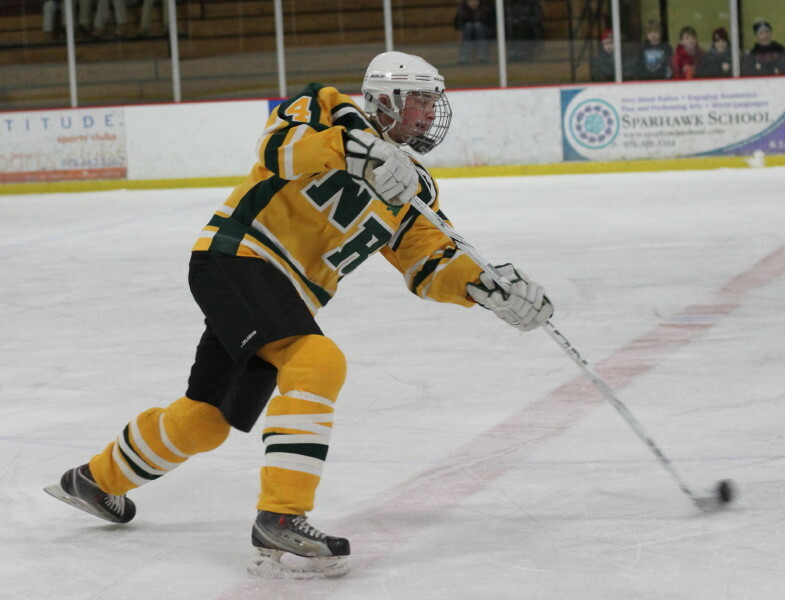 North Reading (2-5 overall/0-4 in CAL) rode a hot goaltender (Keith Linnane – 38 saves) and power play advantages and were tied, 3-3, after two periods. But in the final period, the relentless Clippers were rewarded twice (Cooper Hines & Matt Kelleher) early to get what, at the time, looked like sufficient separation from the Hornets. It didn’t work that way. Defenseman Connor Wile ended up in the penalty box and Mike Moscaritolo beat Clipper goalie Dan Murphy to make things a very interesting, 5-4, late in the game. NR pulled their goalie and the action thereafter was in the Newburyport end. A number of “ooh’s” and “ah’s” indicated how close the Hornets came to tying this one with the extra forward in the mix. 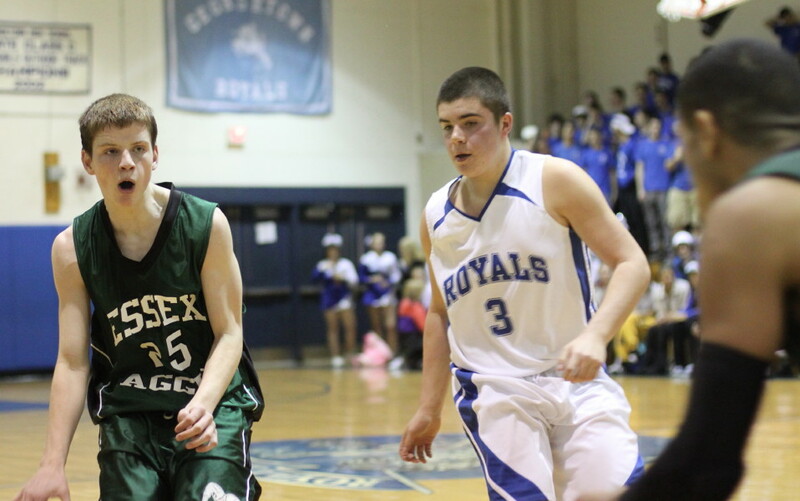 But Newburyport prevailed. 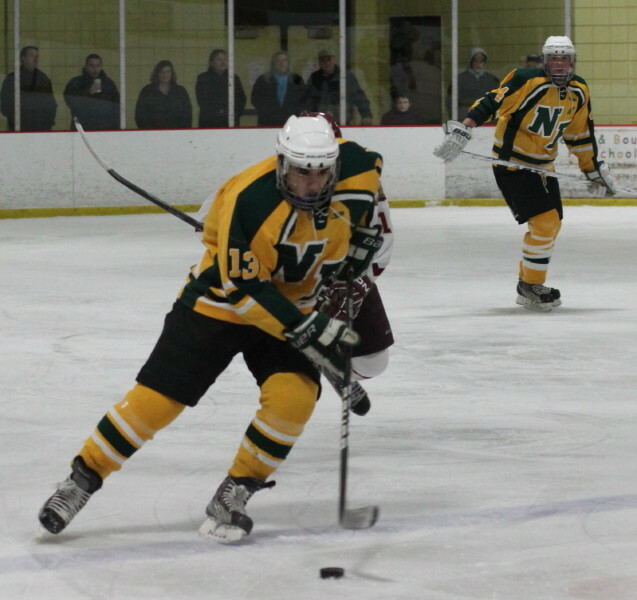 They face North Andover (5-1) on Saturday at 7PM at the Graf Rink. The Knights lost to Triton, 3-1, last night. 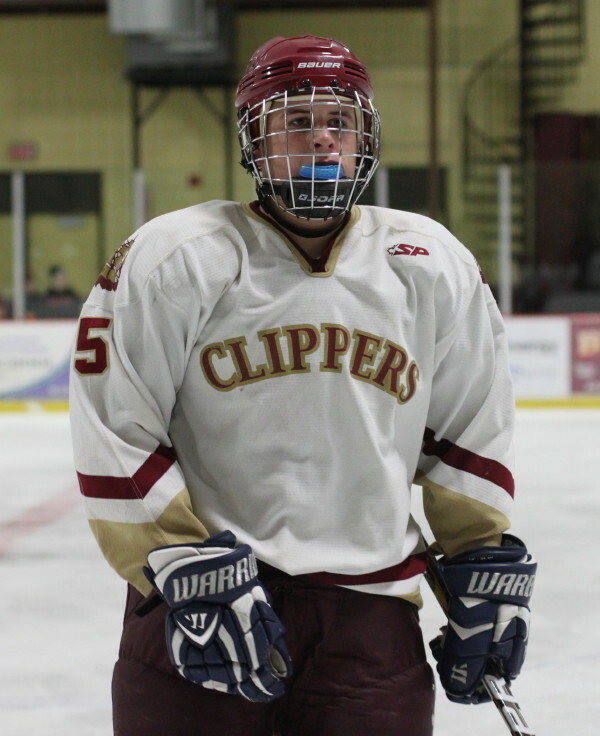 Newburyport goal scorers were: Travis Wile, Jared Bradbury (2), Copper Hines, and Matt Kelleher. 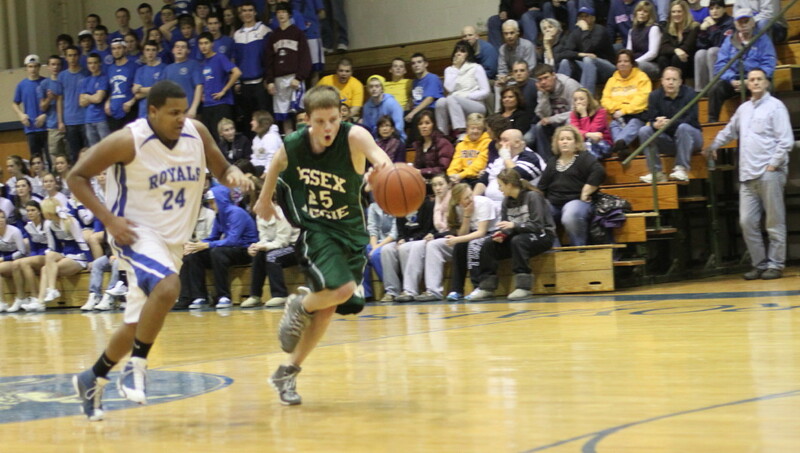 Cam Roy had three assists. North Reading goal scorers were: Mike Brandano, Timmy Potter (2), and Mike Moscaritolo. 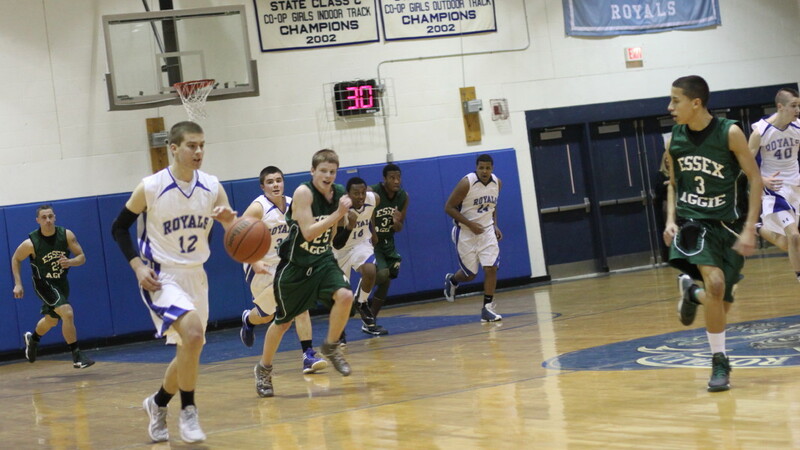 NR is at Pentucket on Saturday (7PM).